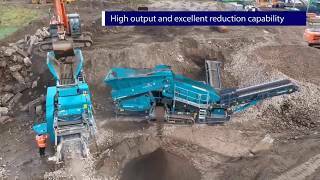 The Powerscreen Premiertrak 400X range of high performance primary jaw crushers are designed for medium scale operators in recycling, quarrying, demolition and mining applications. The range includes the Powerscren Premiertrak 400X and R400X with hydraulic adjust, as well as the Premiertrak 400X post-screen, which allows users to generate a type one product at high volume from one machine. User benefits include hydraulic crusher setting adjustment for complete control of product size, tracked mobility for optimal flexibility of setup and crusher overload protection to prevent damage by foreign objects. Building on the successful Pegson XR400, the ground breaking Premiertrak 400X is an extremely versatile crusher which can be used in various applications. With its hydraulic setting adjustment, the Premiertrak 400X allows the size of product to be changed at the press of a button, minimising the need for downtime. The Premiertrak R400X is from the same series and is the perfect choice for recycling on primary applications. The hydraulic release jaw fitted to this crusher will sense an overload and open when required to protect against serious damage. An optional pre-screen is available on the Powerscreen Premiertrak range to allow the operator to remove the finer material prior to the jaw chamber. The Premiertrak 400X post-screen allows users to generate a type one product at high volume from one machine. It has been designed so that it has a quick release system, to ensure maximum uptime and easy service and maintenance.